Last week’s post on SQLite Concurrency Checks used this repo which contains examples of using Entity Framework Core with SQLite and Postgres. This post is going to tackle concurrency checks using Postgres to keep the projects in the repo with the same level of functionality. You can grab the sample code before any change here. This whole post will only be touch files found in the Postgres folder/project. Unlike SQLite, Postgres has better built-in support for concurrency checks. If you read the official docs on Optimistic Concurrency and Concurrency Tokens you will find that all tables have an implicit/hidden system column call xmin which holds the ID of the latest updating transaction which means it gets changed automatically every time a row is changed. The Postgres Entity Framework Core provide contains an extension that makes it very simple to use the xmin column as a concurrency token. In the ContactDbContext add the following to the OnModelCreating function to enable concurrency checking on the specified entity, in this case, a Contact. Next, from a command prompt in the same directory as your project file using the following .NET CLI command to generate a migration for the above change. 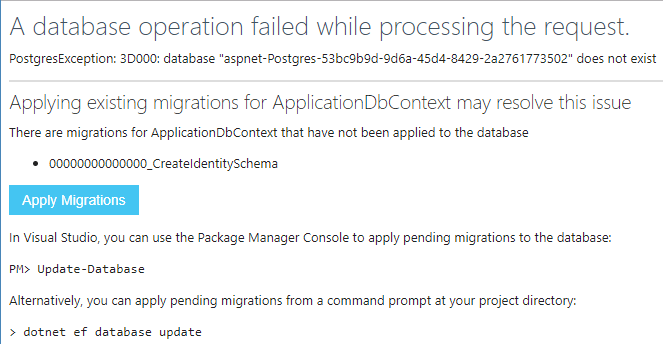 This migration is a bit strange since the column technically already exists, but the migration seemed to be needed. For a quick and dirty test, I added a ConcurrencyTest razor page under the Contacts directory. This function is going to ensure a specific contact exists, then pull the contact from two different DBContexts, make a mutation on the resulting contact objects, then attempt to save. The first save will work and the second should fail. Please note that this function isn’t an example of how things should be done just a quick and dirty way to prove that the concurrency check is happening. This process was much simpler using Postgres than SQLite. Not that the SQLite version was hard just not as simple of a path. With last week’s post, I now have Postgres running in a Docker container. This post is going to cover using Entity Framework Core with Postgres which will happen to be running in the Docker container from last week, but that bit isn’t a requirement for this post. This post is going to be very similar to this one which covered Entity Framework Core with SQLite. Using Visual Studio 2017 I started with a new ASP.NET Core project using the Web Application template with Individual User Accounts for Authentication. Using Individual User Accounts is an easy way to get all the Entity Framework Core stuff setup. 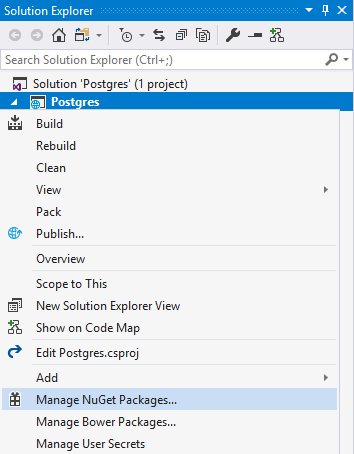 Right-click on the project file and click Manage NuGet Packages. On the Browse tab search for Npgsql.EntityFrameworkCore.PostgreSQL and then click install. Open the appsettings.json file and change the DefaultConnection in the ConnectionString section to a valid Postgres connection string as in the following example. Not that a user ID and password are needed. If you are going to be checking your project into source control I recommend in addition to the above you only store the connection string with the real user ID and password in user secrets which don’t get checked into source control. You can find more information on user secrets here. The final change needed before running the application is in the ConfigureServices function of the Startup class to switch out SQL Server for Postgres. The following shows an example of the change for the ApplicationDbContext. Running the application at this point will work fine until you hit a function that wants to talk to the database. For example, attempting to register a user would result in the following error. If you see this error don’t panic just follow the instructions and they will get you going. The simplest solution is to just click the blue Apply Migrations button and continue your testing. 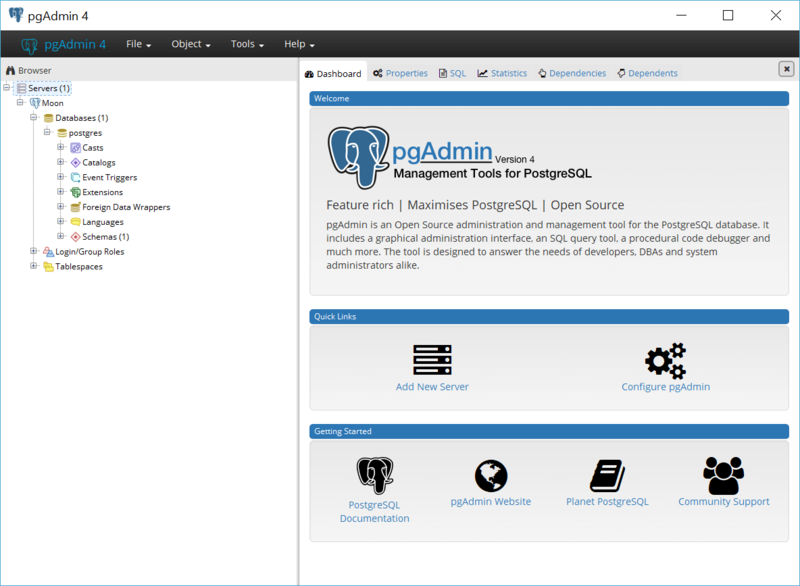 The application is now ready to go using Postgres. 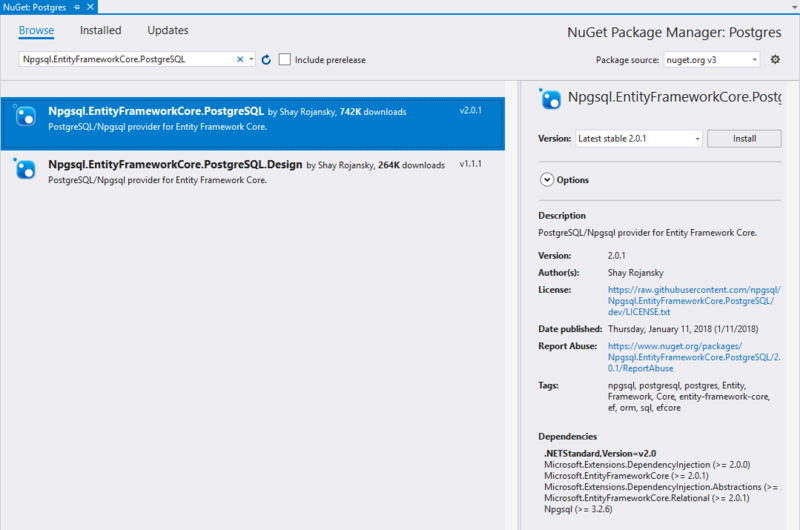 The Entity Framework Core team, as well as the Postgres Entity Framework Core Provider team, have done a great job making everything work with no pain. The official docs for the provider can be found here. I would love to offer some tooling recommendations for working with Postgres, but I haven’t been working with it enough yet to provide any. If you have any Postgres tools you recommend please leave a comment. The code in its final state, which has been expanded to include my standard contacts example, can be found here. Over the weekend I finally got the chance to start reading A Curious Moon by Rob Conery which is a book on learning PostgreSQL by following the fictional Dee Yan as she is thrown into database administrator role at an aerospace startup. 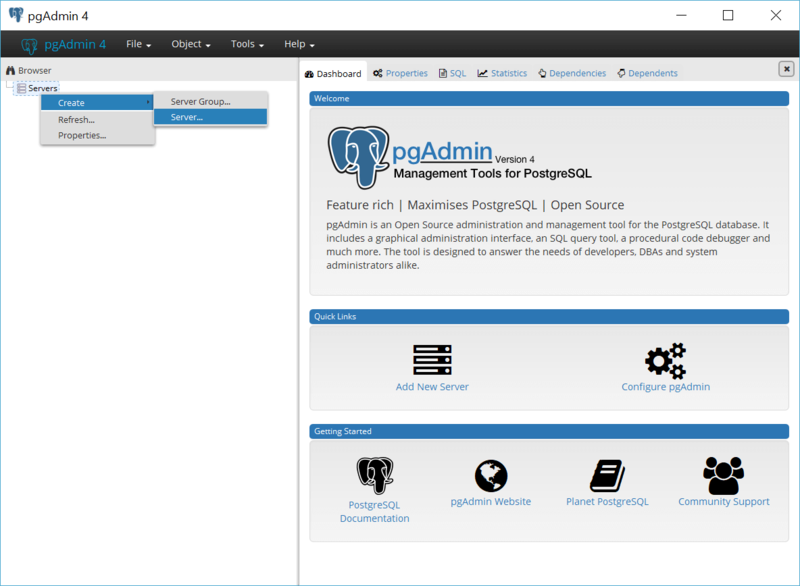 I have a lot of experience using Microsoft’s SQL Server, but up until now, I haven’t touched PostgreSQL. For personal projects SQL Server’s cost and be prohibitive and the release of Rob’s book added up to a good time to give PostgreSQL a try. On the download section of the official Postgres site, there is an option to download an installer. This is the route I was going to at first, but in Rob’s book, he suggests using a VM for Postgres installation on Windows. This kicked off a lot of searching on my part and didn’t find a good definitive answer on why that is or isn’t the way to do. In the end, I decided to try and run the Postgres process using Docker instead installing directly on Windows or dealing with a full VM. Getting up and going with a container running Postgres was pretty simple and could be done with the following command which will create a container and expose the port used by Postgres so it can be accessed from the host. The problem with this approach is if you ever need to rebuild the container for some reason, like a new version of Postgres is released, your data will be lost. Thankfully I found this blog post which shows how to use a secondary container for the data leaving the Postgres container able to be destroyed and recreated as needed. The following is the command I used to create my data container. The above creates a container named PostgresData based on the Alpine image. It is important that the -v parameter matches the path that Postgres expects. Now that we have a container that will keep our data safe let’s create the actual Postgres container with the following command. The only difference from the first example run command is the addition of –volumes-from PostgresData which tells the container to use the PostgresData container. If you run the docker ps -a command it will show you all your containers. As you can see in my example I have two containers only one of which is actually running. Make sure you don’t remove the data container just because it will never show as running. To verify all was working I downloaded pgAdmin from here. Run the installer and then open the application. Right-click on Server and click Create > Server. On the Create Server dialog enter a Name for your server and then switch over to the Connection tab. 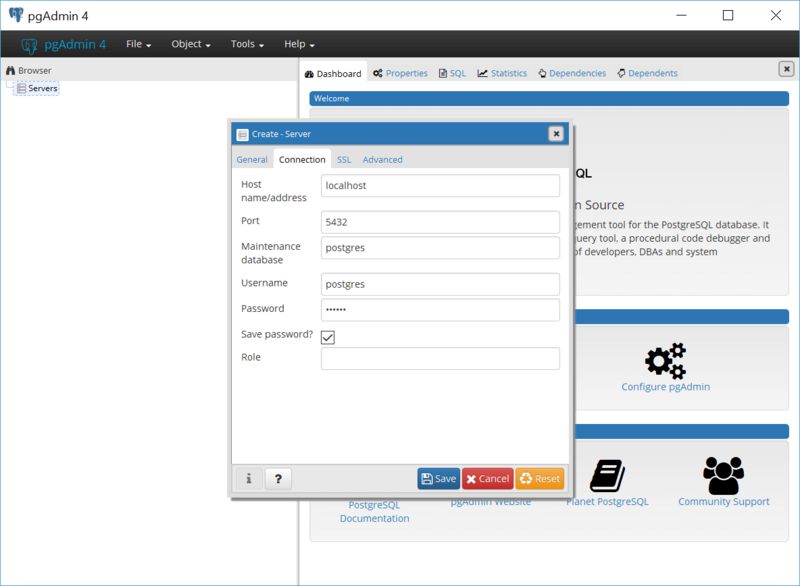 On the Connection tab for Host use localhost and in the Password field use the password you used for POSTGRES_PASSWORD on the docker run command. Click Save to close the dialog and connect to the server. 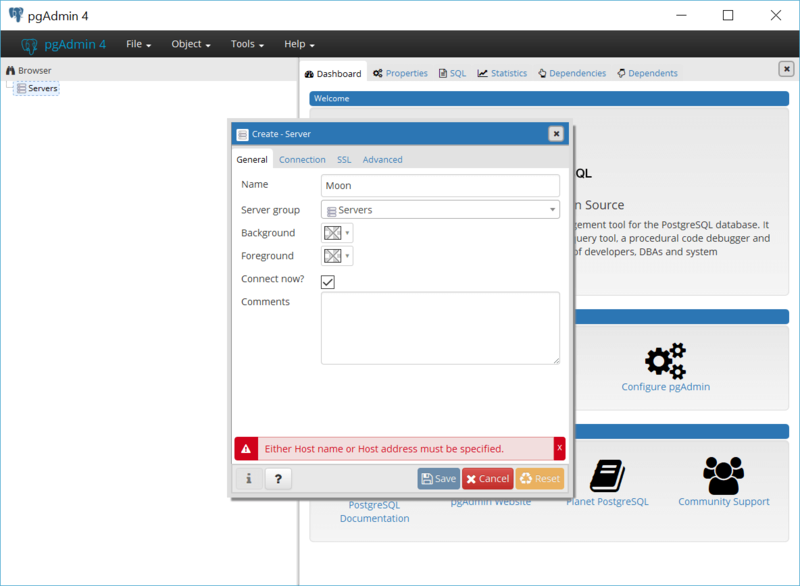 The following is an example screenshot of what you will see showing the available databases on the server, which is just the default database in this case. Make sure to check out the official docs here for more information as needed. Other than the storage portion getting Postgres up and running in Docker was pretty simple. I hope like me this will give you a good jumping off point to learn more about both Docker and Postgres. If anyone has any alternate ways to deal with persistent storage please leave a comment.